WEST ALEXANDRIA — West Alexandria donor Don Stoner is a landscaper who values working with his hands and practicing the plain living of the Old German Baptist Brethren. 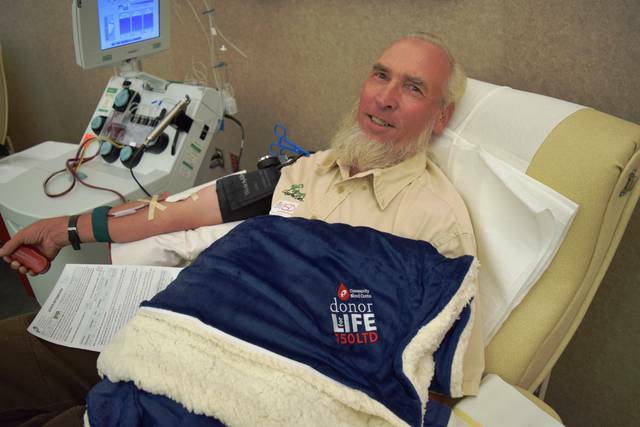 He values also his dedication as a platelet and plasma donor, and on Sept. 5 made his milestone 150th lifetime donation at the Dayton Community Blood Center. Stoner is a type O positive donor, the universal donor for Rh positive patients, and he commonly made double red blood cell donations. In 2015 he made the transition to donating platelets and plasma. Stoner and his wife Amy have three children and eight grandchildren, ranging in age from nine to one. They do a fair share of babysitting for his daughter, a nurse at Kettering Medical Center who has five of the grandchildren.